This a recent episode of THE COIN CHAT, the 2nd podcast I work on. My co-host and I interview Andrew about technology, blockchain, and universal basic income. Andrew Yang is an American entrepreneur, the founder of Venture for America, and a 2020 Democratic presidential candidate. He has worked in startups and early-stage growth companies as a founder or executive for nearly two decades and was appointed to public office in 2015 by the Obama administration as an Ambassador of Global Entrepreneurship. Yang is the author of Smart People Should Build Things and The War on Normal People, about automation of labor. 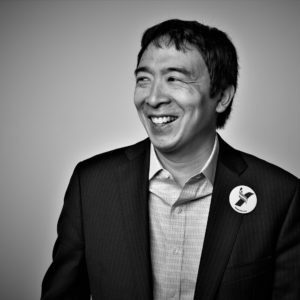 In Yang’s current bid for the 2020 presidential nomination, one of his main campaign goals would be to implement a universal basic income (UBI) for every American adult over the age of 18.